The line chart below shows the amazing growth of Bitcoin value over the last year. A delta bridge highlights the 1217% growth! This line chat was built using Aploris on a Mac with macOS. The delta bridge is a standard feature an can be inserted in a couple of clicks. This entry was posted in Line chart and tagged Business, Economics, Global, Internet, Technology by Aploris. The Mariekko chart below shows how many sites social US news users get news from. Each column represents a social site and the rows indicate the percentage for their US users that get news from just that site, 2 sites (that plus another), or 3 or more sites. The width of each column represents the percentage of social news users that use that site. Facebook has the largest number of social news users and 50% of them only rely on Facebook for news. This chart was built with the Aploris chart creator add-in on PowerPoint for Mac. This entry was posted in Marimekko and tagged Internet, Social media by Aploris. The bar chart below compares the length, measured in kilometers, of the top 15 metro systems globally. In addition, the yearly ridership and number of stations are listed in data rows below the chart. China has a clear lead with 6 cities in the top 15! 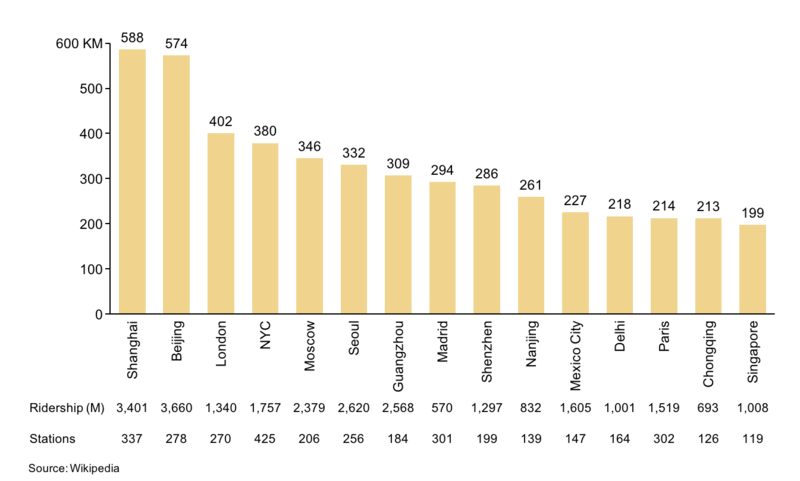 In addition, Shanghai and Beijing have significantly longer systems than any others. This chart was built with the Aploris add-in on PowerPoint for Mac 2016. This entry was posted in Bar chart and tagged Global, Transportation by Aploris. 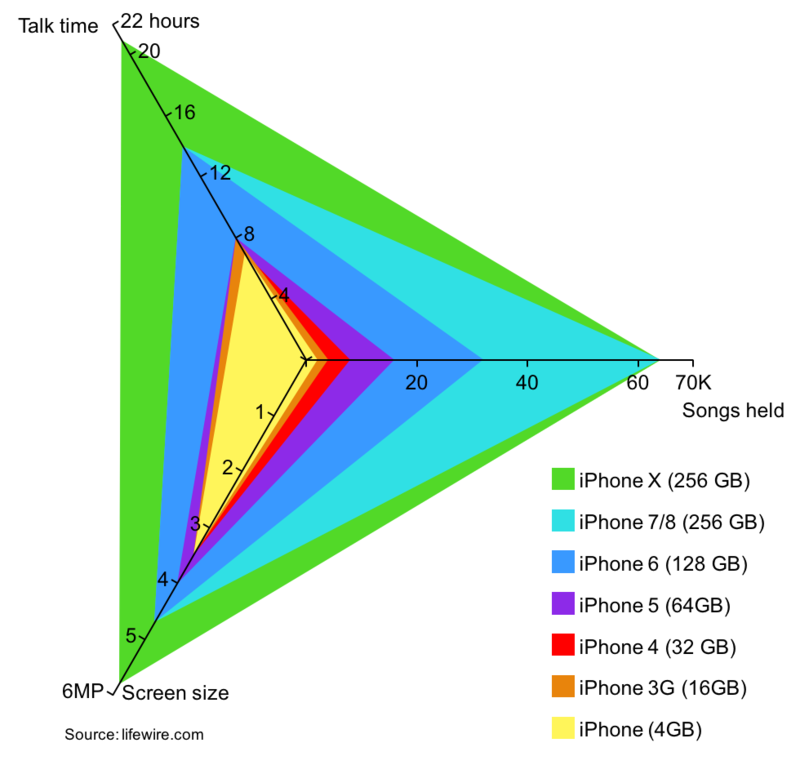 The filled spider chart below compares all primary iPhone models for talk time, screen size, and songs held. Each variable is mapped to an axis creating a 3 axis chart. Therefore, each iPhone is represented by a triangle and the triangle corners map to the phone’s capabilities for the selected variable. As expected, newer models have greater capabilities and as a result the triangle that represents them is larger than the previous model. Over the years, iPhone screen size has not changed as much as battery life (talk time) and storage (songs held). For the selected variables, iPhones 7 and 8 have the same capabilities. This chart was built with the Aploris add-in for PowerPoint. This entry was posted in Spider chart and tagged Technology by Aploris. The area chart below shows the top 5 movie distributors’ market share over the last 5 years. The total height for each year indicates the total gross sales and the relative height of each segment represents the distributor’s market share (among the top 5). In addition, the top performing movie is listed below the chart in a data row. Buena Vista has steadily grown over the last 5 years and took the lead in 2016 with Rogue One. The other distributors have often interchanged market share rankings. This entry was posted in Area chart and tagged Movies by Aploris. The combination bar-line chart below shows worldwide cereal production, utilization, and stocks on a yearly basis. In addition, a data row is used to compare the stock levels with the utilization. To clearly show the data, which is spread over a large range, two axes are used. The left axis begins at 1800 million tonnes to amplify the delta between production and utilization. Production has consistently been higher than utilization which leads to an increase in the available stocks. Further stock levels as a fraction of utilization have also increased slightly. This chart was built using PowerPoint 2016 for Mac and the Aploris PowerPoint add-in. This entry was posted in Bar-line chart and tagged Economics, Food, Global by Aploris. The stacked bar chart below shows survey data by country: “Today, which one of the following do you think is the world’s leading economic power?”. Survey conducted by Pew Research Center. Australia, Canada, and large parts of Europe consider China to be the economic leader while the rest of the world general points to the USA. The percentage point difference between US and China is shown in data column to the right of the chart. 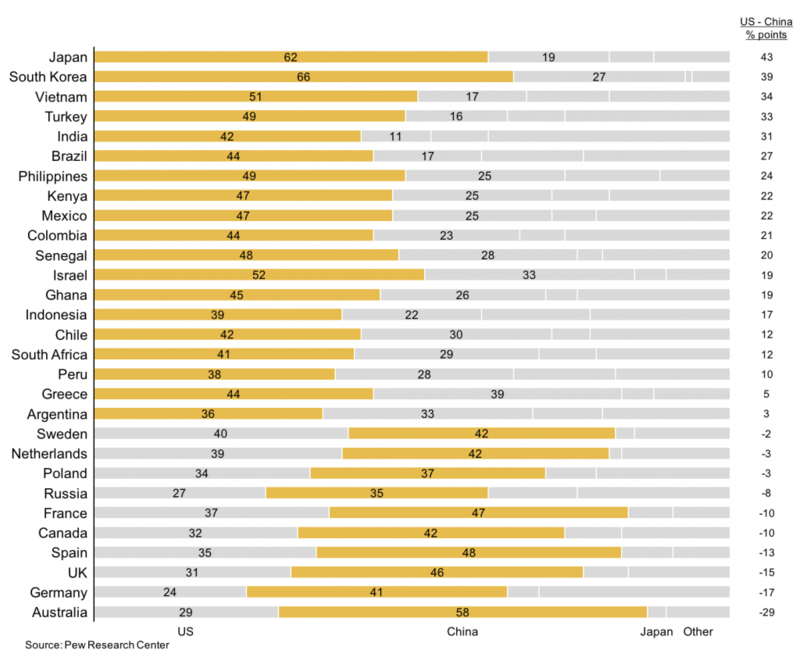 Respondents in Japan and South Korea strongly considered the US as the leading economic power while Australian respondents most favored China. This chart was built using PowerPoint 2016 for Mac and the Aploris add-in. This entry was posted in Bar chart and tagged Economics, Global by Aploris. 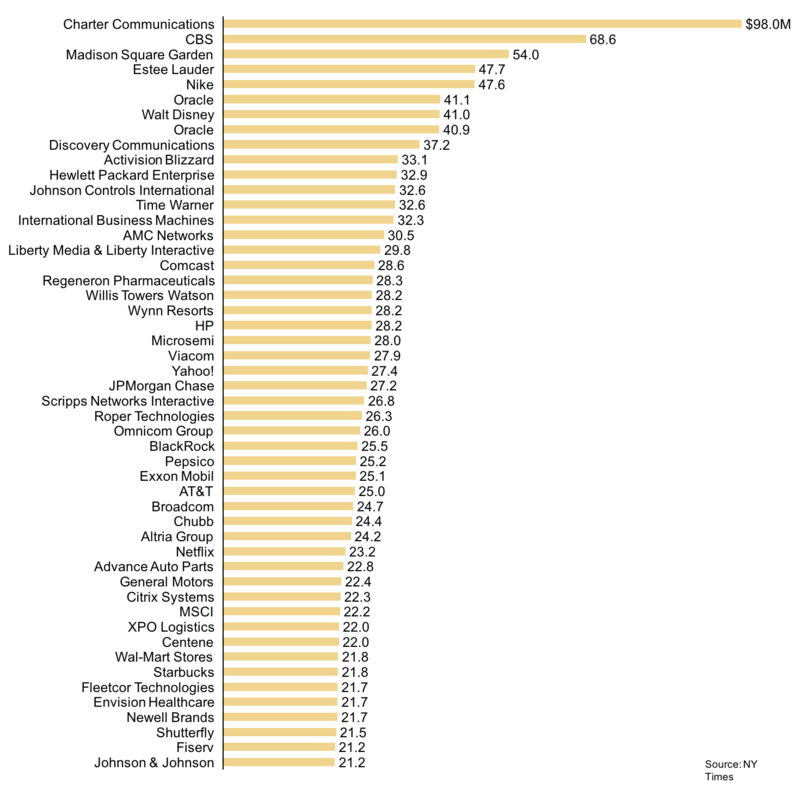 Bar char below shows the top 50 public companies that paid their CEO the most in 2016. The chart is rotated 90 degrees to help better display the data. Charter Communications compensates their CEO the most, almost 50% more than the next highest company, CBS. This chart was built using PowerPoint 2016 for Mac with the Aploris add-in. This entry was posted in Bar chart and tagged Business by Aploris. Bar line chart below shows the percent of words spelled correctly by word length at the Scripps National Spelling Bee from 1996 to 2016. The bars indicate the share of words spelled correctly and the line shows the number of words. The most common word length is 9 letters. The data shows that longer words are not necessarily harder to spell. 3 letter words have appeared three times but only spelled correctly once. The two longest words, 19 and 21 letters in length, were both spelled correctly the one time each came up in competition. This chart was built using Microsoft PowerPoint 2016 for Mac and the Aploris add-in. This entry was posted in Bar-line chart and tagged Entertainment, Television by Aploris. The stacked bar below shows that the average cost of a wedding in the US is $26,720. The largest category, comprising 45% of the total cost, is the venue, catering, and rentals. This entry was posted in Bar chart and tagged Economics, Life by Aploris.